GAZA, (PIC)– Al-Qassam Brigades, the armed wing of Hamas, said its resistance fighters have participated in the rescue and relief efforts taking place in the areas affected by floods in the besieged Gaza Strip. Al-Qassam Brigades has put its human and material resources at the disposal of the authorities in Gaza and helped evacuate many families and citizens from the flooded areas. BETHLEHEM (Ma’an) — An initial estimation of financial losses from the winter storm that devastated the West Bank last week is nearly $12 million, the Palestinian Minister of Agriculture told Ma’an.Walid Assaf said that 20 percent of the losses caused by the storm affected the agricultural sector, with most of the damage in Yatta, Dura, and Bethlehem. Palestinian policemen loyal to Hamas keep guard as a fuel tanker arrives to Gaza’s power plant in the central Gaza Strip December 15, 2013. (Reuters) – Israel allowed the entry of 450,000 litres of fuel, paid for by Qatar, into the Gaza Strip on Sunday to enable the Palestinian territory’s sole power plant to resume operations. Gaza’s 1.8 million people have been enduring daily blackouts of around 12 hours since the power plant was switched off 43 days ago due to a fuel shortage caused by neighbouring Egypt’s closure of smuggling tunnels. “Hopefully, the power plant will gradually resume full operation during the day. The fuel we are receiving from Qatar will allow us only to return to the old schedule of eight hours of cuts followed by eight hours of power,” said Ahmed Abu Al-Amrain of the Gaza energy authority. Qatar answered an appeal by Gaza’s government, led by the Islamist Hamas group, after four days of torrential rains that killed two people and forced the evacuation of more than 5,000 residents from flooded homes, some accessible only by boat. The Gulf state, which is spending $450 million in construction projects in Gaza, will pay $10 million to Hamas’s West Bank-based rival, President Mahmoud Abbas’s Palestinian Authority, which ordered the fuel for the enclave from Israel. Israel has no direct dealings with Hamas, a group that is dedicated to its destruction. Severe weather in the form of heavy snow also paralysed Palestinian cities such as Hebron in the occupied West Bank, as well as Jerusalem and parts of Israel’s northern Galilee, but skies were largely clear on Sunday as crews worked to clear roads and restore electricity to thousands of homes. Ismail Haniyeh, prime minister of the Hamas-run government, said Qatar was also sending a ship loaded with fuel to Israel’s Mediterranean port of Ashdod for transfer to the Gaza Strip. Those supplies, officials said, should keep the power plant partially running for at least 90 days. Under years of Israeli sanctions, Gazan businesses cobbled together a smuggling-fuelledeconomy that sustained the territory. But the Egyptian military, which in July overthrew a Muslim Brotherhood government that had been sympathetic to Hamas, sees the Palestinian group as a security threat and has closed most of the 1,200 tunnels that ran under the frontier. That may have choked off supplies of weapons as intended, but also of commercial goods including construction materials and cheap Egyptian petrol. Patchy alternative supplies of electricity from Israel’s grid have meant 12-hour blackouts every day. On Sunday, some Gazans were able to return to their houses after rescue teams pumped water from flooded streets. But many others were unable to leave their dwellings and government officials said at least 4,000 people were still in shelters. The Hamas government said Qatar will also allocate $5 million to aid Gaza residents affected by the storm. An initial assessment issued by the government put damage caused to homes, businesses and infrastructure at $64 million. Pink Floyd co-founder Roger Waters — who refuses to play shows in Israel and faced a boycott from German fans over an inflatable ‘anti-Semitic’ pig — has said in a recent interview with CounterPunch magazine that Israel’s treatment of Palestinians shares ‘parallels’ with Nazi Germany’s treatment of Jews. Roger Waters has been criticized over comments he recently made comparing Israel to Nazi Germany. Former Pink Floyd front man Roger Waters has caused an outcry after comparing Israel to Nazi Germany. In a recent interview, the veteran rocker said that Israeli treatment of the Palestinians was comparable with went happened in Europe during the 1930s. “The parallels with what went on in the 1930s in Germany are so crushingly obvious,” he said. Waters, 70, also accused Israel as believing that Palestinians are “sub-human” and criticized Washington for being influenced by the Israeli “propaganda machine,” reported the Guardian. Waters is a longtime supporter of the Palestinian cause. His interview was in the left-wing CounterPunch magazine. His comments drew a furious response from Rabbi Shmuley Boteach, who said, “Mr. Waters, the Nazis were a genocidal regime that murdered six million Jews. Waters countered that the Holocaust was “brutal and disgusting beyond our imagination.” He added that this meant “we must always remain vigilant. We must never stand by silent and indifferent to the sufferings of others, whatever their race, color, ethnic background or religion”. Waters was one of the founders of Pink Floyd, back in 1965. BEIRUT (AP) — A Lebanese army force opened fire Sunday along the volatile border with Israel, Israeli officials and Lebanon’s National News Agency said. The Israeli military said that shots were fired at a civilian vehicle traveling along the border, adding that the sniper was a member of the Lebanese military. Arab satellite TV channels Al-Jazeera and Al-Arabiya reported that an Israeli soldier was killed in the shooting, but there was no immediate confirmation of casualties from either side. Andrea Tenenti, a spokesman for UN forces in southern Lebanon, said the UN was informed of a “serious incident along the blue line around Ras Naqoura.” He said UNIFIL is in contact with both the Lebanese and Israeli armies, and that they are cooperating. “The incident happened on the Israeli side of the blue line,” he said, referring to a U.N. drawn line demarcating the border between the two enemy states. Tenenti declined to provide details on what transpired, saying UNIFIL was still trying to determine exactly what happened. Lt. Col. Peter Lerner, an Israeli army spokesman, said Israel had protested “this outrageous breach of Israel’s sovereignty” with U.N. peacekeeping forces and heightened its state of preparedness. “We will not tolerate aggression against the state of Israel, and maintain the right to exercise self-defense against perpetrators of attacks against Israel and its civilians,” he said. The Lebanese National News Agency said the shooting occurred near the Naqoura border crossing but did not provide more details. Lebanese security officials did not immediately comment. It was not clear why the Lebanese soldiers opened fire. The army has opened fire in the past after they said Israeli soldiers tried to infiltrate the border area. Israel fought a war against Lebanon’s Hezbollah in 2006, which broke out after the Iranian-backed militant group’s guerrillas crossed into Israel and captured two Israeli soldiers. The ensuing month-long conflict killed about 1,200 Lebanese and 160 Israelis. Yemen’s parliament on Sunday called for a stop to drone attacks in a symbolic vote that reflected growing public anxiety about Washington’s use of the unmanned aircraft to combat al Qaeda in the impoverished country. Motions passed by the Yemeni parliament are not binding and can be struck down by the president, and are seen as no more than recommendations to the government. 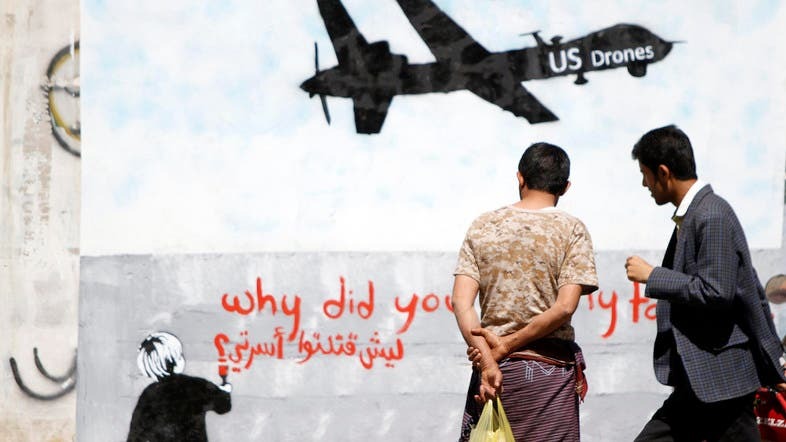 The United States has stepped up drone strikes in Yemen as part of a campaign against al-Qaeda in the Arabian Peninsula (AQAP), regarded by Washington as the most active wing of the militant network. Stabilizing the country, which is also struggling with southern separatists and northern rebels, is an international priority due to fears of disorder in a state that flanks top oil producer Saudi Arabia and major shipping lanes. The United States says its drones program has been successful in eliminating al Qaeda in various countries. Some Yemenis say had it not been for such strikes, AQAP could have seized more territory across Yemen. Yemeni foreign minister Abu Bakr al-Qirbi told Reuters in September that the drone strikes were a “necessary evil” and a “very limited affair” that happens in coordination with the Yemeni government. However, other Yemenis, and some U.S. politicians, say the strikes and civilian casualties are increasing sympathy for AQAP and resentment against America. AQAP, which has scattered across the country, is now targeting local police and security officials, who have only tenuous control in Yemen. On Thursday, fifteen people were killed in an air strike while on their way to a wedding in the central al-Bayda province, according to local officials. The government said senior al-Qaeda militants had been targeted in the attack, and made no mention of civilian casualties. The parliament session started with a minute of silence to remember the victims of a Dec. 5 attack by an al-Qaeda-affiliated group on a defense ministry compound in Sana’a in which at least 56 people were killed. WASHINGTON (AFP) — US Secretary of State John Kerry insisted Sunday concrete progress has been made in peace talks between Israelis and Palestinians, but said details will be kept under wraps. “But we’ve agreed not to be talking about what we’re doing because it just creates great expectations. It creates pressure. It creates opposition, in some cases. “I think it’s much better for us to do exactly what we’ve been doing, which is negotiate quietly and privately,” he continued. Before Kerry’s latest trip to the region, he had said “we are closer than we have been in years” to reaching a deal. And State Department spokeswoman Jen Psaki had said the United States was “focused on a final deal” rather than an interim agreement. On Sunday, Kerry expressed optimism that this was “a different moment” for the conflict that could allow “a different set of choices” than in past, failed efforts. “I think that the dynamics of the Middle East offer a different moment, the possibilities of peace with the Arab League, the realities of what might and might not stare people in the face if you don’t get an agreement,” he said. An Israeli soldier fires a tear gas canister towards Palestinian stone throwers. Reports say Israeli forces opened fire on the man late on Saturday when he approached a forbidden security zone east of Khan Yunis. Princess Rym of Jordan has called for a transition of the state-owned media to public control, to stop channels being used as a ‘mouthpiece’ for the government. Much of Jordan’s media is under tight state control, a situation that has attracted criticism from press freedom groups and which was a factor behind recent protests by local journalists. Princess Rym, who is married to a member of Jordan’s royal family, said that the local media should “transition” from state to public control. Princess Rym was speaking in a personal capacity as founder of the Jordan Media Institute (JMI), a non-profit institution that runs courses in journalism. She has a background in media herself, having worked for outlets such as CNN, where she began as a producer in 1998 and later worked as a Baghdad correspondent from 2001 until 2004. Jordan declined by six places in the Reporters Without Borders annual Press Freedom Index, with the country ranking behind countries such as Colombia, Libya and Zimbabwe. In October and November this year employees of the government-owned Jordan Press Foundation (JPF), which publishes al-Rai and The Jordan Times, staged protests and one-day strike over the government’s appointment of a former minister as JPF’s chairman. Employees of the newspapers urged for more freedom and independence when deciding editorial policies. Jordan has also come under fire for blocking hundreds of news websites, under a controversial 2012 law that requires such sites to be licensed. In June, international rights groups slammed Jordan’s decision to block unlicensed sites, saying the move amounted to censorship. Much of the country’s local media is state-run, such as Jordan Radio and Television, which runs several channels. Princess Rym pointed to public-ownership models such as the BBC in the United Kingdom, which is funded by a license fee paid by viewers. Princess Rym spoke on Nov 30 at the close of the Al Arabiya Global News Discussion, which saw three expert panel sessions discuss the theme “bridging the communication gap between East and West.” The event was held to mark the relaunch of this website and its new View More video service. Princess Rym told Al Arabiya News about her career as a journalist and current work at the Jordan Media Institute. Q. Jordan has seen recent protests by journalists, and the country declined in the Reporters Without Borders (RWB) Press Freedom Index 2013. What’s your response to that? As far as the Jordan Media Institute is concerned, our role is first to train journalists to the highest level, but also train them to… exercise their right to freedom of expression, which is guaranteed by the constitution. [Given the recent] protests, there is a debate currently in Jordan about how this is going to be going forward. There are issues with government media in Jordan. And issues need to be solved. In September, the institute graduated its fourth intake of students. It provides a parallel track: on the one hand there’s the academic track, which is an Arabic-language practical one-year master’s degree. And on the other hand there’s the training. We’ve reached the point where not only are we running it and we’re graduating students, but that also our students have been finding jobs. And that’s quite a nice indication of the fact that I hope we’re preparing them for real life in the field. Q. You attended Columbia University’s School of Journalism. How does the Jordan Media Institute course differ from the education you received? I’ve always said very openly that I was inspired by the Columbia curriculum when we designed the curriculum for the Jordan Media Institute. We were very lucky that we were able to call on experts from Columbia, from City University [in London], from the journalism school in Lille, France… So we got everyone together and we really hashed out what we thought would be the best curriculum to be both practical and relevant to our region. A lot of what I took away from Columbia was the practical aspect, the guest lectures. After I graduated and started working, I think I can safely say that most days in my career as a journalist, there was something that I took away from Columbia that I found useful in my career. And I wanted our students to benefit from this similar experience… that would really be useful to them in their careers as journalists in the region. So that’s why it was important that it was in Arabic, it was important that we had regional and local experts as well as international experts… I’m trying to prepare journalists that are extremely professional, and that can work anywhere in the world at high standards. Q. You worked at CNN for a number of years in Baghdad, Iraq. What kind of stories were you covering there? I was there during the time of Saddam, and then a little bit during the war, but not that much because we were expelled very soon after the war started. And then of course, right after the fall of Saddam which presented its own challenges as well in terms of reporting the area. It was a very rich and intense experience. I feel very lucky and privileged that I was able to do that. And I learnt a great deal. It was a time when many people were embedded [with the armed forces] during the war, and – without casting a judgment on anyone – for me, in terms of how I wanted to report the story, I was happy that I wasn’t embedded. That’s because I’d always felt that our job as reporters is to shed a light on the people that you’re reporting on. And I had a lot more leeway to do that not being embedded. Q. What are the challenges specific to reporting on the Arab world? People are becoming much more media-savvy in the region. But maybe culturally there is a little bit more reserve with regard to the media. If you’re in New York and you’re on the street with your camera, you can just put your microphone in front of almost anybody and they’ll be happy to say a few words. But it’s not as simple in our part of the world: People are a bit more shy, a bit more reserved. Sometimes when it comes to women– in certain more conservative areas – it might be more tricky to get that access. So you need to know how to go about it. So there are lot of things that are quite different, which is why I think it is important that we [at JMI] did something homegrown. A lot of people suggested to me when we set up JMI, ‘why don’t you import Columbia University’. I was very happy that I went to Columbia University, but I think what we needed in our region was something that was much more relevant to our needs, how we report about things. We talk a lot about self-censorship of journalists in our region. Some of it comes maybe from government pressures to a degree, but some of it comes from our society’s pressure. And I think in our part of the world, a journalist also has to take into account a lot of things. I remember one reporter saying that it was very difficult for him because he was on a business beat somewhere, but his uncle was the head of the airline, and he had issues with him every time he reported about the airline. So family ties are quite close, and that can create sometimes some issues. We’re also now going through a lot of changes in the region when it comes to the role of the media within our society, and again this is why it is important for us to be really well implanted in the region and follow how things are going, how the role of the media is changing. You need to know the difference between government media and the others, which is obviously very different in the West, where there is more of a public media, not government mouthpieces. Q. What implications does the Arab Spring have on the way the media works and how is JMI responding to this? I think maybe there were hesitations among some students – there were a few demonstrations and they were a little bit concerned – [asking] ‘should we go?’. And we said, ‘of course you definitely should go; you are reporters, you have press cards, and that’s what you’re there for’. I don’t know that we’ve seen any changes because at the outset we were very determined to make JMI a place where there is freedom of expression, a place where people can go and do as professional reporting as they can in real time as they learn. Q. Is the Western media getting its reporting of the Arab world right? I think it’s got much better. On the whole there have been a lot of genuine efforts to get it right. What is in effect a sad consequence of today’s media landscape in the West, which is the closing down of international bureaus, might actually have one silver lining to it, which means that they have to call on local journalists. And I think that can only increase the understanding and really getting it right. So, in a way, that could be an opportunity.